Not long after the Lodge meeting, I spend a day volunteering with my own club at an all-day genealogy fair; I help run a table for my lineage group, meeting and greeting prospective members, and talking about genealogy. The Older Fellow stops by, appreciatively taking a list of prospective members we’ve collected for his club. The weather outside is windy – so windy that one bridge is closed, and large numbers of homes lose power – but inside the exhibit hall it’s warm and friendly and there’s plenty of electricity to power everyone’s laptops and iPads. The ladies and I stay later than we should, but they have no power at home, so we find excuses to keep talking. It seems like business if there are laptops involved. We pore over websites with lists of lineage societies and discuss which ones we are all eligible for. We agree we can all join a lot of them, but what’s the point of that? We search for the most unique one we can each join. One of the ladies proudly proclaims her descent from a colonial witch, and shows us that society’s site. I make a mental note not to cross her. I discover there’s a society for descendents of colonial tavernkeepers; you have to be 21 to join, because all their meetings take place in New England pubs. I’m eligible for this one, and we all agree their meetings are probably worth flying across the country to attend. There’s a society for descendants of Royal Bastards, and we’re all eligible for this one. What are the odds? I ask. We discuss the odds. We wonder if there’s been a study about this. We google, and agree more research – and probably some math – is needed. Eventually, we realize we’re among the last ones there, and The Child is texting me: Are you coming home soon? I’m hungry. Driving home is a bit of a challenge – branches and trees litter the roads, and many stoplights aren’t functioning. But when I get home, there’s power, and just exactly enough in the freezer to make dinner: Half a Costco bag of frozen shrimp, some cornbread, an egg. I found this recipe in the Washington Post Cookbook , and it seemed easy enough – just chop a few things, mix, and fry the resulting patties. 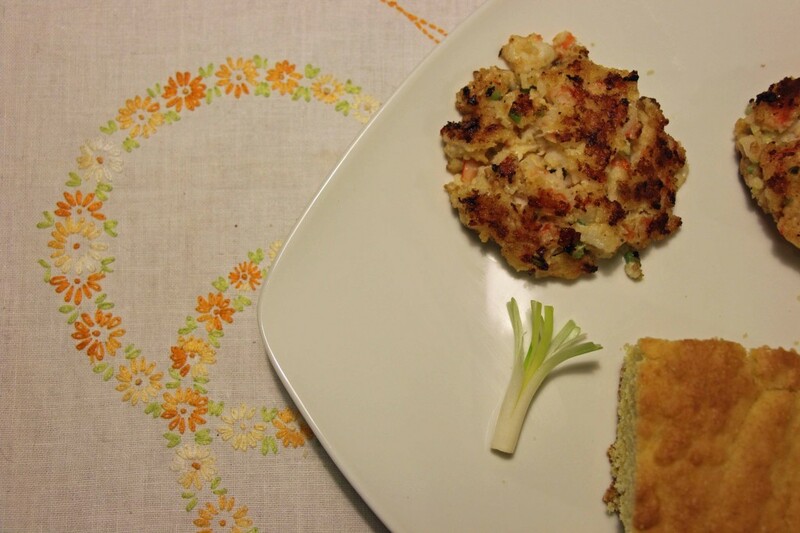 I took a chance that The Child might eat these, because she does eat shrimp as well as crabcakes, and this seemed like a nice cross between the two. It turned out to be exactly that, and I liked how the slight sweetness of the cornbread complemented the shrimp. We served them with cornbread and honey on the side, but they’d be nice on a roll with some aioli. Or on top of a salad. Or as an appetizer. Or anything. The Child helped herself to seconds, and I added the recipe to my permanent file. Finely chop the shrimp, and add to a large mixing bowl with the celery, scallions, and lemon zest. Add the mayonnaise and cornbread crumbs, stirring to combine. Season with salt, pepper, and tabasco to taste; mix well. Add the egg and stir until well incorporated; the mixture should just barely hold together. Form 8 4-inch burgers. Cook the burgers in the oil, in a large skillet over medium-high heat, about 3-4 minutes on each side, or until lightly browned. I chopped the shrimp by hand and the burgers were a bit chunky and fell apart more than I wanted. The recipe suggests pulsing half the shrimp in a food processor to vary the texture, and I think this might help them hold together. Just wanted to put out a note that I had frozen two of these and they did really well in the freezer. Lad and I ate one each this afternoon for lunch.